UPDATED: Sat., March 17, 2018, 11:40 p.m.
STANFORD, Calif. – Going into Saturday’s game, the challenge was obvious: How do you slow down a physical, high-scoring junior forward who also can shoot from outside? 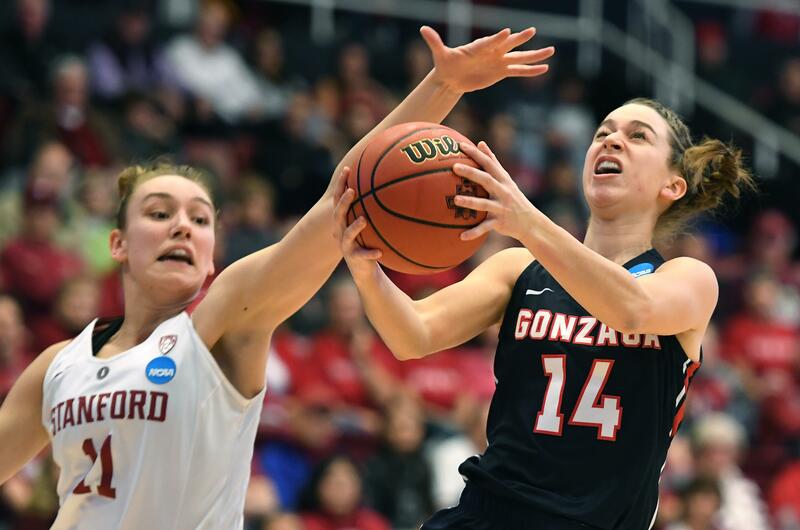 Actually, Stanford never really shut down Gonzaga star Jill Barta in their first-round NCAA Tournament game. However, the Cardinal posed the same question to GU, which had no answers for Alanna Smith. The 6-foot-4 junior was a presence inside, but also made a trio of timely 3-pointers on the way to a 20-point afternoon as Stanford beat GU in the NCAA Tournament at Maples Pavilion. Then again, any 3-pointer is timely when you average just 28 percent from the season. The first came early in the second quarter, helping Stanford during an 11-2 run that turned a four-point lead into 13. The next came in the in the opening minute of the third quarter, offsetting a layin by GU’s Zykera Rice and restoring Stanford’s double-digit lead, 50-38. The last dagger hurt the most. Midway through the third, after GUcut the lead to eight, Smith drained another from the side. Three minutes later, GU was down by 17 and running out of answers. While Barta had to work hard for her 21 points, Williams made it look easy. Unless you’re tasked with stopping her. Faced with relentless drives in the lane by Stanford guard Brittany McPhee, the Zags had little choice. “That’s how we defend that offense, because of all the cutters, and most people don’t put their unskilled player right there,” Fortier said. “Stanford is too smart for that. So everybody backs off and backs off, and they pop them (Smith) right out there,” Fortier said. In other words, Stanford had too many weapons. “It’s difficult when the drivers can just penetrate in the middle and it opens up everything,” said guard Emma Stach after her final game in a Gonzaga uniform. “It’s just difficult to defend when you’re just, like, not keeping them out of the paint,” added Stach. Published: March 17, 2018, 10:47 p.m. Updated: March 17, 2018, 11:40 p.m.